Now Magnus and Alec must race across Europe to track down the Crimson Hand and its elusive new leader before the cult can cause any more damage. As if it wasn't bad enough that their romantic getaway has been sidetracked, demons are now dogging their every step, and it is becoming harder to tell friend from foe. 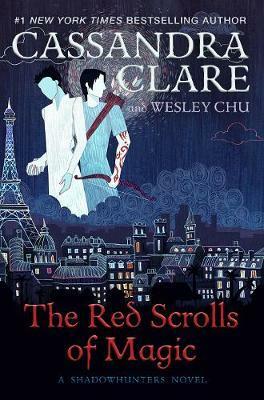 As their quest for answers becomes increasingly dire, Magnus and Alec will have to trust each other more than ever-even if it means revealing the secrets they've both been keeping. Cassandra Clare is the author of the #1 New York Times, USA TODAY, Wall Street Journal, and Publishers Weekly bestselling Mortal Instruments series and the Infernal Devices trilogy, and coauthor of the Bane Chronicles with Sarah Rees Brennan and Maureen Johnson. She also wrote The Shadowhunter's Codex with her husband, Joshua Lewis. Her books have more than 36 million copies in print worldwide and have been translated into more than thirty-five languages. Cassandra lives in western Massachusetts. Visit her at CassandraClare.com. Learn more about the world of the Shadowhunters at Shadowhunters.com. Wesley Chu was a finalist for the John W. Campbell Award for Best New Writer. His debut novel, The Lives of Tao, earned him a Young Adult Library Services Association Alex Award and a Science Fiction Goodreads Choice Award Top 10 slot.